Pixie Dust Healing: New Moon: Boundary Confusion? Have things been feeling a bit chaotic these days? If that's the case, not only are you not alone, it would seem there is at least a pretty good astrological explanation of why that might be happening. For an interesting explanation of the planetary line-ups, check out the Pele Report http://newparadigmastrology.com/ He talks about the chaos that is floating around out there. Today marks a New Moon in Pisces phase and since new moons are a time of beginnings, maybe this can be the beginning of a more defined pattern in the chaos? I've written about the New Moon in Pisces before http://pixiedusthealing.blogspot.ca/2012/02/new-moon-in-pisces.html In fact, I've written about it a couple of times before. Perhaps that's because this kind of energy inspires both emotions and creativity, and in my world, both of those energies together certainly inspire writing as well as chaos. Perhaps writing to try and make some sense of the chaos. 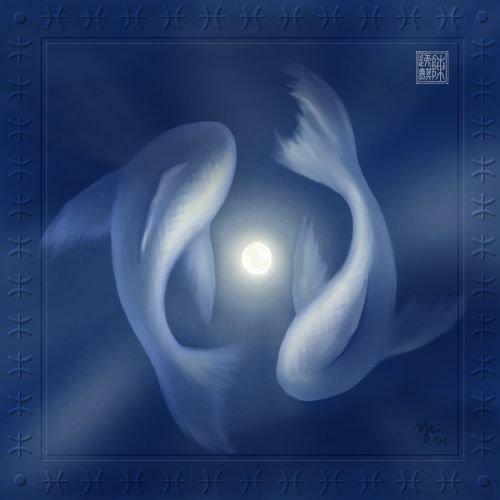 The thing about the moon in Pisces may be that there is a lack of boundaries. That seems to be what we are experiencing through all the moon phases these days and perhaps it is even more magnified during this moon cycle. Pisces energy is sensitive and emotional but very permeable, open to the influence of others and perhaps "blurred around the edges". So during this type of energy we can become easily immersed in the issues of others, of "stuff" that really isn't, or at least doesn't need to be, our own. In Shamanic Astrology, the animal sign equivalent to Pisces is Wolf. "Wolf people" and therefore this type of energy, are full of contradictions. Wolves get uncomfortable if they don't have enough space and freedom to move around and yet they get equally anxious if they spend too much time alone. They will make personal sacrifices for the good of the pack, but that can sometimes prevent them from developing their true potential and discovering things that would benefit the pack. They tend to spend time helping others but then get depressed when they don't have any time left for their own "stuff". Sounds like that "boundary issue" again. Also sounds a bit chaotic. Seems to me that the message is: if you are going to start something new, just be sure it's really "your thing" to start, and not just a contribution to overall chaotic energy and boundary blurring. Maybe if you're feeling stuck in the middle between forward and backward momentum, it's time to take a sideways step. In last year's post about the New Moon in Pisces, I suggested the Bach Flowers Scleranthus and Wild Oat. Scleranthus is helpful for that indecision, back and forth, right and left brain confusion that might come up during this energetic time. Wild Oat might be helpful if you are really feeling uncertain, not just between two things, but with multiple potential projects. These two essences might still be appropriate, but this year it seems to me a better essence might be Red Chestnut. The positive potential of Red Chestnut is an ability to care for others with compassion but not anxiety. With it comes the ability to give help when asked but hold back when it isn't required. It's about being response able rather than responsible again http://pixiedusthealing.blogspot.ca/2013/02/response-ability-vs-duty.html . Once you hold back a bit, you might realize you do have the time to start something for yourself. Maybe you don't have as much work to do as you thought. Maybe you aren't late or early, but right on time. Maybe you can let go and let be. Maybe sitting in the middle between moving forward and going backward is, in fact, a pretty comfortable place to be. Perhaps that is balance. Pisces is a water sign. When you find yourself in the water exposed to tides, waves, currents and flow, you can try swimming like crazy against the flow. It might work. Most likely you'll find yourself staying in the same place until you're too tired to keep going and then you'll just end up getting swept along with the flow. You might find yourself in a different place than you really wanted to be. That might be okay. That might mean a long walk on the shore back to where you left your flip flops. If you've decided you're the only sensible one and therefore the lifeguard, you might find yourself hollering to people to watch out, grab the life preserver, swim out to the side, or don't go in the water in the first place. They might listen to you. But, maybe they are just happily floating there. When you're floating in the water, it's pretty hard to hear anyone. It can be a very relaxing place of balance. Maybe this Pisces New Moon energy is a chance to let go and float for a bit. Maybe the "new project" we should be starting is a new attitude of starting to "be" rather than "do". Maybe it's time to just be yourself, unencumbered by worry and concern for others. Maybe within your own boundaries "all is well". Full Moon In Libra: Balance in Chaos? Asperger's, Bach Flowers and "Being Frank"